How is lymphedema treated? Can lymphedema be cured? Treatment for lymphedema can include both conservative and non-conservative measure. Manual drainages, compression garnements and bandages must be done as soon as possible to try to reverse the situation, or, at least, avoid a continuous degradation. 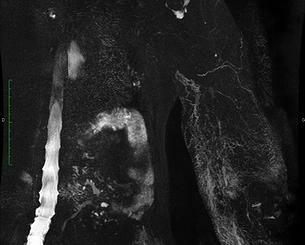 If the lymphatic MRI shows remaining drainage (like on this image) physiotherapy can give excellent results. These measures require specialist care, a long term commitment from the patient and are therefore expensive. They are also short-lived as the reduction in size of the limb is provided only as long as the compression and massaging are done regularly. Another limitation of conservative measures is that they don’t change the limb girth as they can’t prevent the fat deposits and fibrosis in the tissues as the disease progresses. Surgical options have therefore an important role and a combination of therapies may achieve the best results. When the lymphatic MRI shows a total lack of drainage due to adenomectomy and radiotherapy, it is clear that a surgical treatment is indicated. Physiologic surgery aims at restoring the lymphatic function. Autologous lymphnode transplantation (ALNT), also called microsurgical vascularized lymph node transfer (VLNT) is a procedure where a lymphedematous recipient site is prepared by releasing scar tissue, then a flap containing healthy lymph nodes with an artery and vein is harvested from a donor site and placed at the recipient site. The artery and vein of the flap are then connected to an artery and vein at the recipient site. Lympholymphatic graft is a procedure that connects a blocked lymphatic vessel to an unobstructed one using a vein or a lymphatic vessel as a graft. Debulking procedures seek to reduce the volume of the affected extremity either by liposuction or by excising excessive skin and subcutaneous tissues. Discussing your treatment options is done after a thorough clinical examination and lymphatic MRI. Autologous lymph node transplant ALNT (or microsurgical vascularized lymph node transfer – VLNT) is a surgical treatment option for lymphedema. ALNT reduces the risk of infection and cellulitis – The healthy lymph nodes transferred restore the important immunologic role of the lymphatic system in the damaged and fibrotic tissues. ALNT improves brachial plexus neuropathies. ALNT can also be combined with breast reconstruction flaps and provide a great option for a breast cancer patient. Who makes a good candidate for ALNT?